In any case, delightful lettuces grow in this part of the world nearly year-round. They are floppy or pert, frilly or reserved, pastel green, deep maroon, or freckled. They are the stars of the show at springtime farmers markets, and I find them irresistible. Here’s a nice thing to do with any sturdy, crunchy lettuce. (Romaine is the classic, of course, as we’re riffing on the Caesar salad here, but it gets much more exciting than that.) Sorta-Ceasar Salad: Mince two cloves of garlic and mix with about 1/4 c. olive oil in a salad bowl. 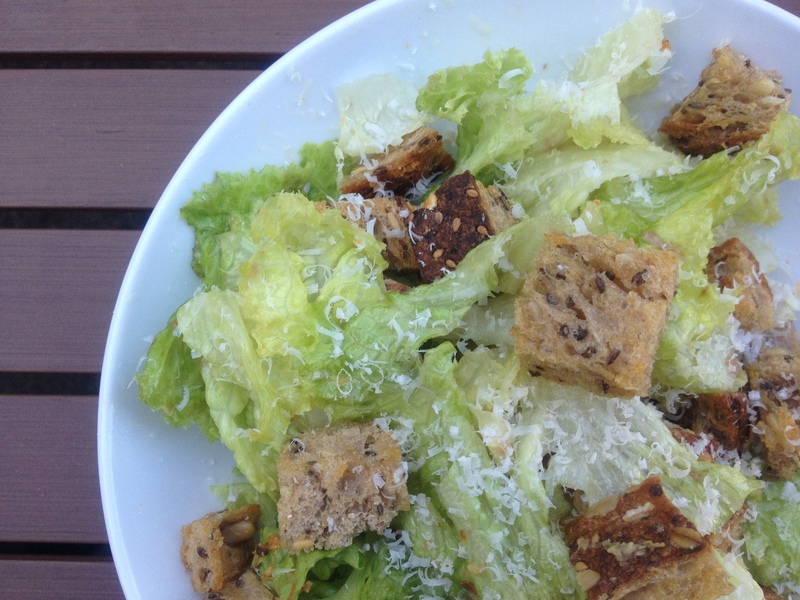 Set aside to infuse while you wash your lettuce and cut bread for croutons. Toss 3/4″ bread cubes with 1 Tb. of the garlic oil and a sprinkle of salt and bake at 350 until toasted, stirring occasionally (about 15 minutes). Mash a few anchovies into the garlic oil in your bowl if you like, along with few good dashes of Worcestershire sauce and 1/2 tsp. dry mustard. Add lettuce, grated Parmesan cheese, and the juice of half a lemon and toss well. Taste and adjust seasoning with salt, pepper, and more lemon juice or olive oil as needed. Add croutons and toss again. I am so envious of your lettuces! Here in St. Louis we usually get a long spring lettuce season if we get the seeds planted early enough, but this year was all out of whack. Between the wild swings in temperature where the heat made the lettuce bitter, and the rabbits, we got not one leaf out of our garden! Now I am waiting for the tomatoes. We should have a good crop this year, I hope! They are still little green marbles, but maybe in a couple of weeks we will have some! I love finding fellow Seattle Bloggers! Looking forward to meeting you tomorrow at the BlogHer dinner at Canlis. Have you ever been? I’ve been lucky enought to go a few times this year and it is FABULOUS!! Excited to meet you! What session are you at this morning? Those croutons look amazing. I don’t even like croutons and I am planning to make them :) I didn’t realize that you were a California girl! North or South California? Do you ever make it back?